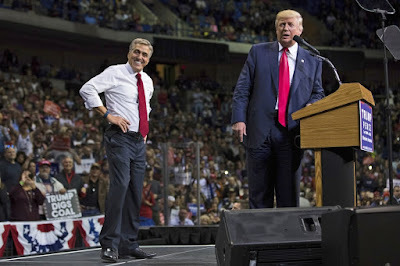 HARRISBURG — U.S. Rep. Lou Barletta, an early supporter of President Trump, has announced his candidacy to unseat U.S. Sen. Bob Casey. The Republican congressman released a campaign video on Tuesday announcing his run for the seat held by Casey, a two-term Democrat. Barletta’s entry into the race was widely expected after the AP reported last month that he had relayed his plans to GOP officials and activists. Barletta, the former mayor of the small Pennsylvania city of Hazleton, rose to political prominence as a foe of illegal immigration. Trump had urged him to run for the Senate. In a statement, Pennsylvania Democratic Party spokesman Max Steele highlighted Barletta’s support of efforts to dismantle the Affordable Care Act. U.S. Rep. Lou Barletta with Donald Trump at the Mohegan Sun Arena in Wilkes-Barre during the presidential campaign. Pennsylvania’s polls are open from 7 am to 8 pm on Election Day. Pennsylvania allows voters who can’t make it to the polls on Election Day to vote by absentee ballot. Learn more about voting by absentee ballot. In order to vote, you must be registered to vote by the voter registration deadline that is approximately 30 days before Election Day. Click here to learn how to register to vote. April 12th, 2017 - 9:47 am - updated: April 12th, 2017 - 10:06 am. 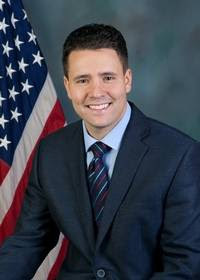 A five-term state representative from western Pennsylvania is the third Republican to say he’ll seek the nomination next year to take on Democratic U.S. Sen. Bob Casey. According to an Associated Press story, Rep. Jim Christiana said he’ll emphasize his work bringing people together, developing the state’s economy and making government more transparent. The 33-year-old lives outside his hometown of Beaver, where he was elected to the borough council as a 21-year-old college student. Other announced Republican candidates are Allegheny County state Rep. Rick Saccone and Berwick borough councilman Andrew Shecktor. Casey plans to seek a third six-year term next year. He’s a Scranton native and the son of the former state governor with the same name. Next year’s primary and general election races for U.S. Senate in Pennsylvania are likely to be very costly. Another Republican is in the running to challenge Democratic U.S. Sen. Bob Casey in next year's election. March 1, 2017, at 10:49 a.m.
HARRISBURG, Pa. (AP) — Another Republican is in the running to challenge Democratic U.S. Sen. Bob Casey in next year's election. Andrew Shecktor, who ran successfully last year as a delegate for Donald Trump to the Republican National Convention, said he will formally announce his campaign for the Republican nomination in the coming days. Shecktor has filed candidacy paperwork with the Federal Election Commission. 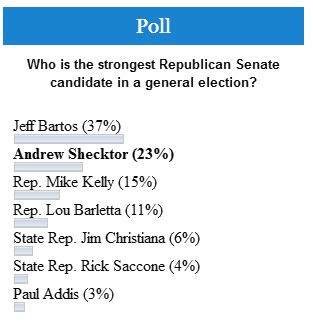 The 60-year-old Shecktor also is a Berwick borough councilman in northeastern Pennsylvania. This would be his first race for statewide office. Also running is Republican state Rep. Rick Saccone of suburban Pittsburgh. In the meantime, some members of Congress and top state lawmakers are gauging their chances against Casey or considering running for governor next year against Democratic Gov. Tom Wolf.